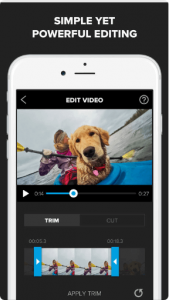 Simple yet powerful, Splice makes it easy to create fully customized, professional-looking videos on your iPhone, iPad or iPod touch. Imagine the performance of a desktop editor, optimized for your mobile device. Just tap to trim clips, adjust transitions, add slow motion effects and more to create beautiful videos you’ll love to share. It’s never been easier to edit like a pro on the go. Works with photos and videos captured with your GoPro and phone. Add title slides, text overlays and a custom outro. Choose from a huge variety of free music and sound effects, or use a song from your own iTunes collection (subject to iTunes terms). Add narration or custom sound effects with the built-in voice recorder. Trim and mix multiple audio tracks with precision. Share right to YouTube, Instagram, Facebook, Vimeo, Mail, Messages and more. Share HD videos using an unlisted web link. Save videos to your camera roll in up to HD 1080p. Have feedback? Email us at support@spliceapp.com or visit gopro.com/support. Some features require newer devices and the most recent iOS version.